Fancy surprising your dinner guests with something a little different to Makizushi? 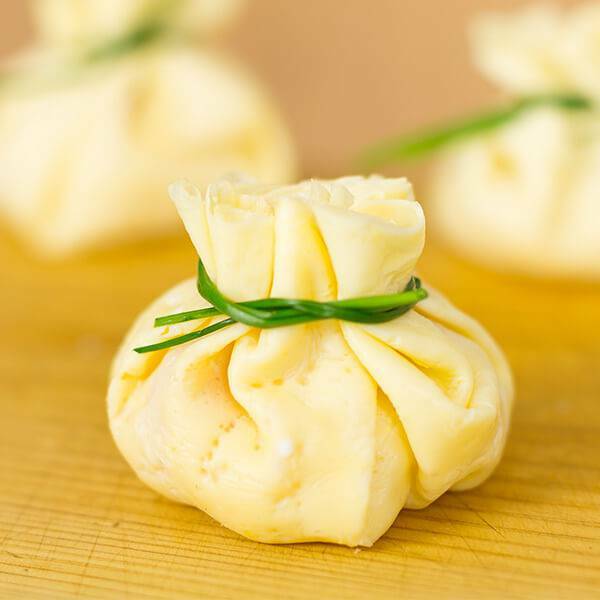 Light, decadent, and extremely versatile, Chef Devaux’s Sushi Money Bags can be adapted to incorporate myriad of exciting and exotic fillings. This recipe marries the earthy flavor of Shiitake mushrooms and delicately seasoned sushi rice, coupled with sushi grade salmon and roe. Finished with a dainty chive tie, these mysterious little bags are just the ticket for those who love surprises! If using dried Shiitake mushrooms, you will need to prepare these 4-5 hours in advance of intended use to allow them to fully soak, and absorb the Dashi stock flavor. Transfer a large handful of mixed size, dried Shiitake mushrooms to a tall, airtight plastic container, and cover with 250 ml of cooled Dashi fish stock. Seal and refrigerate for four hours. Once marinated, pour the entire contents of the container into a large cooking pot. Add 20 g/ ml of Mirin and bring to the boil. Allow the stock to simmer briefly, cover, and leave to cool for 20-30 minutes. When the stock has cooled, remove the mushrooms one by one using a pair of metal tongs, or a slotted spoon. Prepare the Shiitake mushrooms by slicing into 0.5 cm (1/5 of an inch) thick slices, then set aside. At this stage, you may also wish to season and cook your sushi rice, giving it sufficient time to cool before Step 3. Pour 50 g/ ml water into a large glass mixing bowl, followed by 10 grams of corn starch. Use a whisk to combine the two. In a second bowl, separate three eggs. Retain the yolks only. Crack a further three eggs into the corn starch and water mixture. Then, pour in the egg yolks. Finally, add 2 grams (1/4 teaspoon of salt), and whisk together to a smooth consistency. Spray your frying pan with a little oil, and heat on a low setting. Pour a little of the omelet mixture into the pan, angling it over the heat to ensure the mixture covers the entire surface area. Return to the heat and cook for a few seconds prior to turning it over. Using a butter knife, gently separate the omelet from the sides of the pan. To turn it over, gently grasp opposite sides with two pairs of metal tongs and lift. Cook for a few seconds on the second side prior to removing from the pan. Repeat this process for as many “money bags” as are required. Cut the salmon filet in half, lengthways. Discard one half, and slice the remaining piece into four equal sized strips (approximately ½ cm wide). Position the strips horizontally in front of you, and holding them firm with your fingers, begin slicing into small 0.5 cm cubes. Move to one side of your chopping board. With both sets of tongs, transfer one of the omelet pancakes cooked earlier onto your chopping board. Ensure it is as smooth as possible prior to adding the fillings. 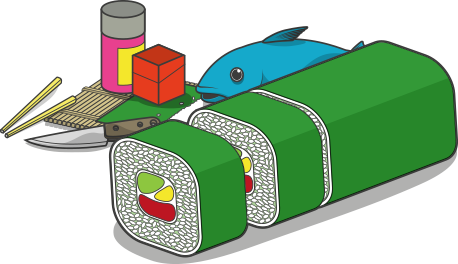 Next, place a small ball of cooked white sushi rice at the center. Atop the rice, add a few small cubes of salmon. You may find it easier to use two teaspoons, rather than your fingers, to create the heaped shape necessary for the money bag’s form. Top the salmon with a little roe. To ‘close’ the bag, simply lift up two opposite sides of the pancake and bring them together at the center, above the filling. Hold these with one hand, then bring up the 3rd and 4th sides one by one. Hold the edges firmly in place by pinching a little with your fingers. Next, wrap two chives around the ‘neck’ of the bag, and secure with a knot to the front. Repeat the above for the Shiitake mushroom money bags. Top with a few toasted sesame seeds prior to closing the bag for a little extra texture and flavor. Serve on a sushi board with a simple carrot and/ or cucumber garnish to compliment the green chives.